My energy level was low and I putzed doing laundry and sitting in the sun on my terrace. Allyson came, shopped for some groceries, and cooked me a lovely large pot of home made chicken soup as well as a couscous salad which I love and haven't had for a long time. When she left, Habibi and I watched a movie and napped, after which we did venture up to the studio. Didn't work on Medicine Woman, although she did impart further information, which I will fill you in on later. I attempted to design a Christmas card which I will share with you probably tomorrow. Wendy popped in later in the day with a lovely little pot of home made lemon curd (drool) which I will put on my toast the next time I have some. Because I don't have any updates from the studio, I will bring for you today, the offering of a piece of my writing which I did last autumn. I hope you enjoy. 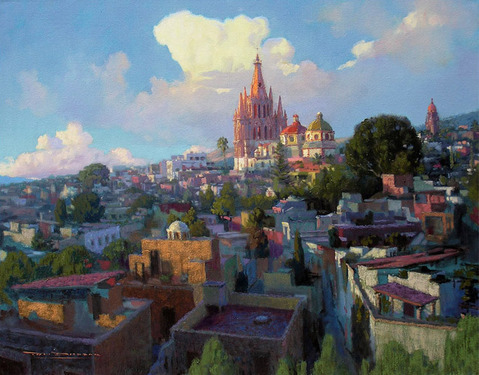 So you have some 'visual stimulation' I am enclosing a photo of a recent painting of San Miguel. It is by a local artist. Unfortunately, I am not able to give credit as I didn't take note of his name. For that I apologies. I do like the painting very much. It is a lovely rendering. Enjoy. Love your verse from last year, Donna, and the image of just sitting in the autumn sun sounds delicious! I hope you are finding time for that again this year...oh and lemon curd.......so good! Lovely friend who made it for you! Lovely, peaceful... quiet days are good! It's good to have a relaxing moment, hour, day...it helps to heal inside and out. What a beautiful picture of your area. So great Allyson is cooking and helping you. Hope you have a great week. Hi Donna, I've mentioned it before but your writings are so real they make me feel I'm there with you. The painting of SMA is gorgeous, so vibrant. I enjoyed your post a lot. Am so happy to hear that you have some love ladies taking care of you and like their menus too ! I love you writing Donna and feel so blessed to have met you and to be part of your journey. The painting beautiful idyllic . Thank you.